In warm weather when bees are active no mouse would dare to enter a beehive but during the winter, when the bees are clustered together and unable to defend the hive, mice can climb in with impunity and clearly relish the shelter and supply of stored food. They build a nest of grass and leaves in the hole they make and by spring will have had a family in their comfortable home. Usually the bees die, possibly because of starvation or stress. 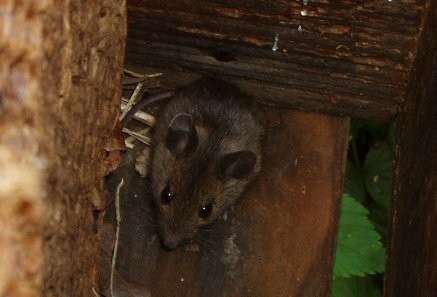 A hive with a mouse nest inside has a characteristic slightly unpleasant smell noticeable as soon as the roof and crown board are lifted. The usual method to prevent mice entering the hive is to put mouseguards on at the end of October. The photograph above shows a purpose made zinc mouseguard with 9mm holes. A mouse skull is wider than it is high so it is able to get through a 9mm high slot but not through a 9mm wide hole or gap. In early spring when fresh pollen is vital for early brood rearing it is important that the mouseguard does not knock pollen off the bees legs so aligning the holes in the excluder with the floor is a good idea. 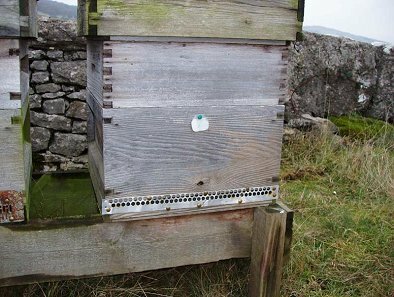 Remove the guard towards the end of March once it is warm enough for the bees to be actively defending the hive. Bees, quite understandably, do not appreciate a beekeeper hammering away at the hive entrance trying to attach a mouseguard however neatly it may be lined up with the floor. Make the holes in the mouseguard for the pins at home and then the little home made gadget with a small magnet attached as shown below is invaluable for quick and easy drawing pin manipulation when wearing gloves.